When you hear the name Johnny Appleseed, what do you think of? Do you think of the Legend of Johnny Appleseed segment in the 1948 Disney film Melody Time. The segment is also one of four (Johnny Appleseed, Casey Jones, Paul Bunyan and John Henry) that are packaged together in Disney’s American Legends. I remember watching Melody Time as a kid and really enjoying the kind hearted Johnny Appleseed. Especially the part with the skunk. When he befriends the skunk, all the other animals then trusted him. Of course, Johnny Appleseed was not a legend, but a real person. The deceased was well known through this region by his eccentricity, and the strange garb he usually wore. He followed the occupation of a nurseryman, and has been a regular visitor here upwards of 10 years. Many years ago my Grandmother told all of us kids that we were related to Johnny Appleseed. My 3rd Great-Grandmother is Maria Betsy Chapman, and my Grandmother claimed that she was a cousin of Johnny Appleseed. 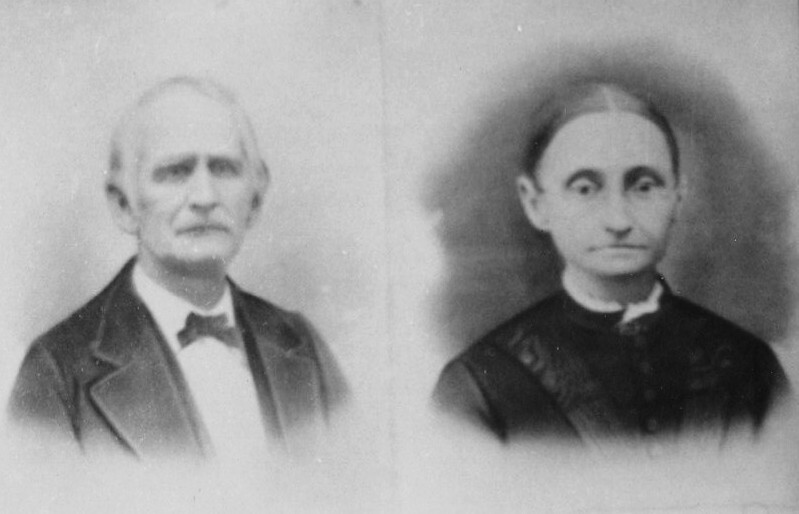 George Shafer and Maria Chapman – My 3rd Great-Grandparents. I am not sure where my Grandmother got her information, as I have not found the claim in any other letters or papers from other family members. My Grandmother did not even know who Maria’s parents were. It is only in the past several years that I have been able to trace her family further back. Alas, as several of the family stories have turned out, Maria was not a close cousin of Johnny Appleseed. John Chapman is a descendant of an Edward Chapman who was born in England in the early 1600’s. Maria is a descendant of a William Chapman who was born in England in the mid 1600’s. Of course there is a possibility that the families may be connected in England, but we do see that Maria and Johnny were not close cousins. I have confirmed some of the relationship claims that my Grandmother has made. I also have found many new connections that are notable and plan on writing about them in the future. Genealogy is a great way to learn about history, as you chase down clues to the lives of your ancestors. This entry was posted in Family History, Food, Genealogy, Memories and tagged Apples, Culture, Family History, folklore, Genealogy, history, Johnny Appleseed, legend of johnny appleseed, nature, plants. Bookmark the permalink. When I was 14 I attended a wilderness camp with classmates where we had to sing a song before meals: Oh the lord is good to me and so I thank the lord, for giving me the things I need the sun the rain the apple seed, the Lord is good to me. I still remember it 37 years later. Interesting to hear the story of this man. We didn’t study it in Canadian Public school. The song is well know and is used in several different organizations, including the Boy Scouts. These types of family stories are always so tantalizing–and yet so hard to confirm. Geneaology is so interesting. While I was growing up I was always told that my great-grandfather on my mother’s side had immigrated to the U.S. from Ireland. I have discovered that my mother’s side actually has US-born roots going back at least to my 4th set of great-grandparents. They were all born & raised within 50 miles of each other so I have no idea where this Ireland story came from. I’m still looking for Irish roots. Keep looking, if the stories are there they may have a grain of truth. I have Irish roots, but they are all from early immigrants, not from famine era immigrants. Yours may be the same. Do they have Irish surnames? I don’t know. My grandmother’s surname was Lafferty but there is discrepancy once you get back far enough as to whether the last name was Lafferty, O’Laverty or O’Flaherty. It gets difficult to trace from that point back.